You are currently browsing the tag archive for the ‘Wolli Creek Flying Fox Camp’ tag. I was fortunate to see two mums with pups. 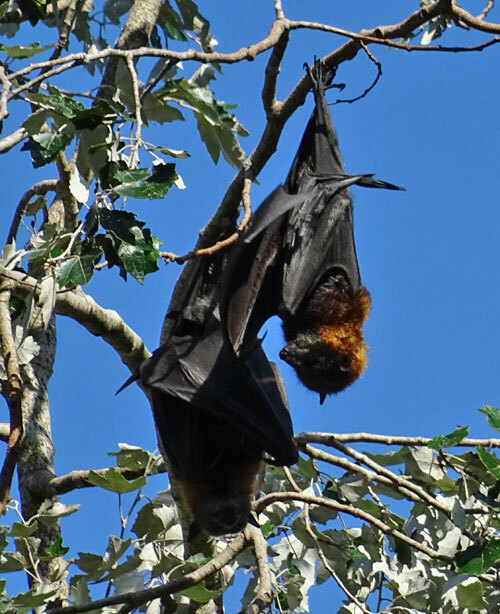 I recently visited the flying fox camp in Wolli Creek for the first time & what a delightful experience that was. We have such a treasure on our doorstep. The trees that the bats roost in are visible from Turrella Reserve. The walk to get there is quite easy. 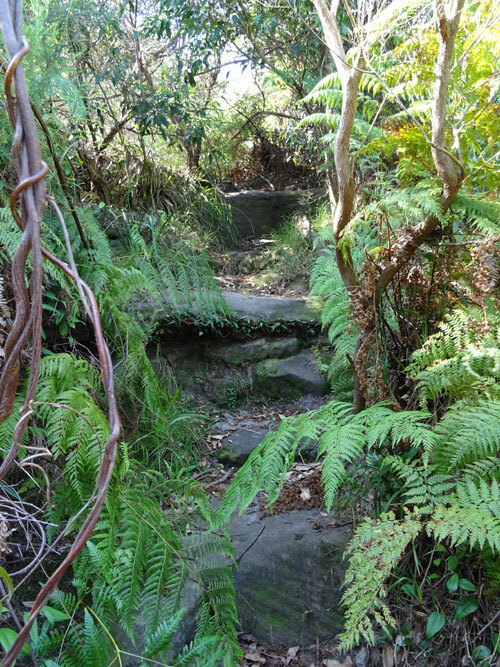 You enter the bush of Wolli Creek at the National Parks & Wildlife sign & follow your nose taking the paths that travel downhill. Within 10-15 minutes, depending on how often you stop to look around, you come to a massive sandstone boulder locally known as ‘Dragon Rock.’ Look over the boulder & there across Wolli Creek are the bats – in all their splendor. I really liked that the camp is separated from people because it keeps the bats safe. The view from Dragon Rock is excellent & you will want to take your camera because the sight is amazing. 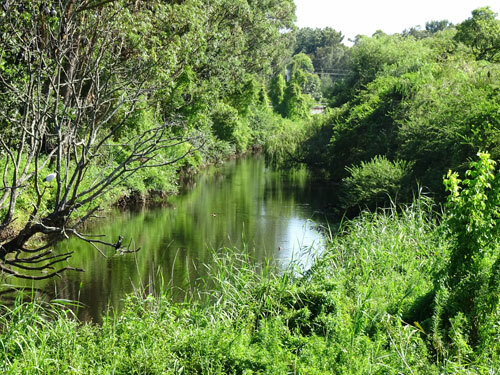 Wolli Creek is quite wild in this area. There is no concrete & no mown lawns. 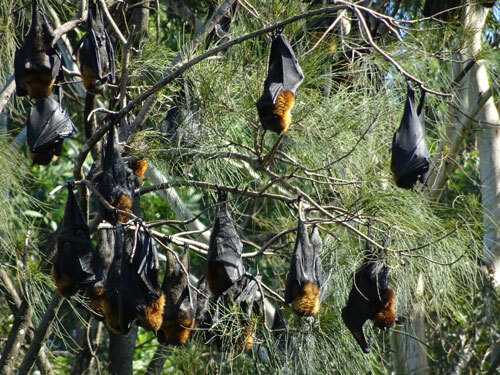 The bats hang from a group of tall Eucalypts & to a group of Poplar trees further along the creek. If you return to the main path & head west following the creek, you will see the bats hanging in the Poplar trees. These trees are much nearer to the path allowing a closer view of the bats roosting here. Quiet though, as they are sleeping. 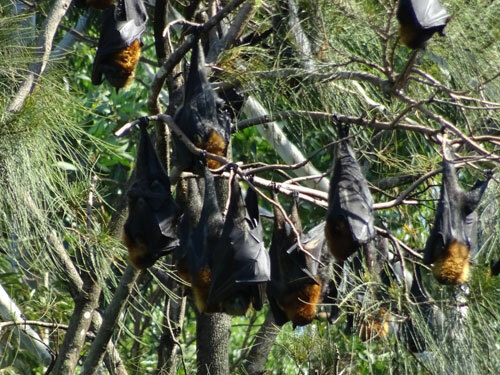 There are around 12,000 flying foxes, including endangered grey-headed flying foxes in the Wolli Creek camp. 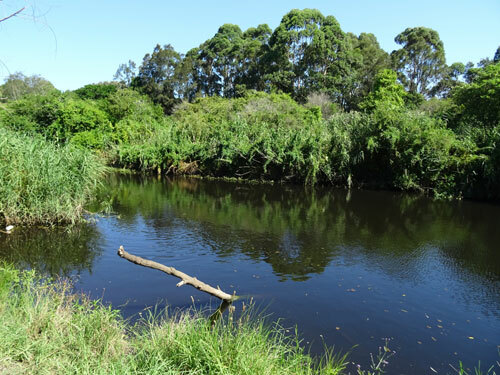 This is an extremely important piece of bushland close to the city. It provides much benefit for people & also offers a safe place for wildlife. Despite the weeds, there is much biodiversity here & there were many plants in flower. I’ve seen birds in Wolli Creek that I haven’t seen in Marrickville LGA. The bush is particularly useful for little birds. It is worthwhile taking a trip up Nannygoat Hill. I did not know that there is an easy way to the top from the back of the hill, so we took the harder route. It is not too hard, but there are some sandstone boulders taller than people that require you to climb & scramble over. Wolli Creek is a popular place for people to exercise. While we were there a number of people were running the tracks & one man had done the circle up & down Nannygoat Hill around fifteen times & had not finished yet. I mention this because how hard the trek to the top of the hill really depends on your fitness level. The view from the top of Nannygoat Hill made any struggle worth it. If you want to take the easy route, you can access ‘The Walk’ via Albert Park on Hocking Avenue. This path travels over flatter sandstone, but the track is not suitable for wheelchairs or people unsteady on their feet. Every month volunteers for the Wolli Creek Preservation Society count the bats from Turrella Reserve as they fly out for the night. The Society welcomes volunteer counters. It is not hard to count the bats & training is provided. Bats galore! It’s a wonderful sight. Wolli Creek looking west. The colony is on the left.